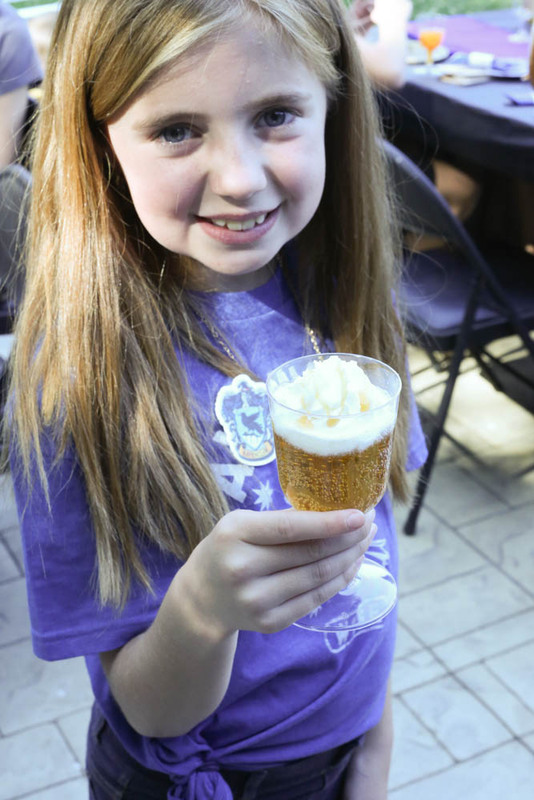 Earlier this year, Sadie read the first Harry Potter book. Then promptly sped through the rest of the series-and then started them over again once she finished! I am so proud lol but seriously parenting win right there, since I read the series as a teen and devoured them as well. 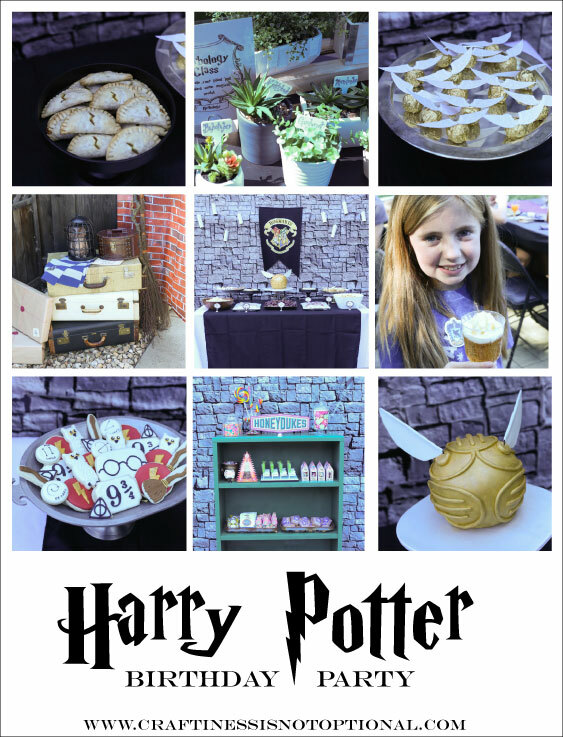 (like most of the world) So, it was a pretty clear winner for her 10th birthday party theme! 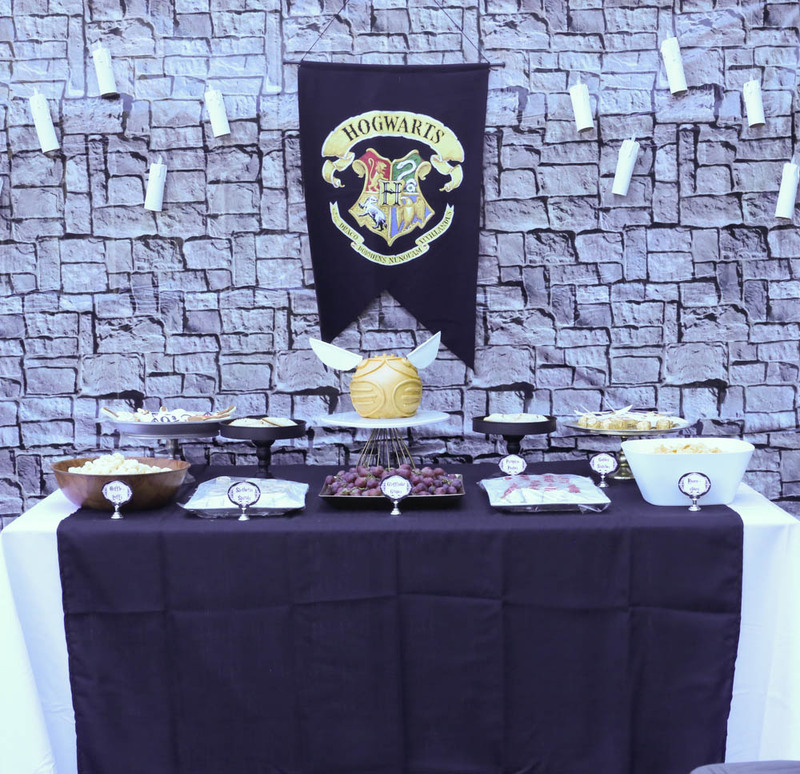 I had to go all out too, because I never do a theme twice, and I had to do Harry Potter justice. So here goes! 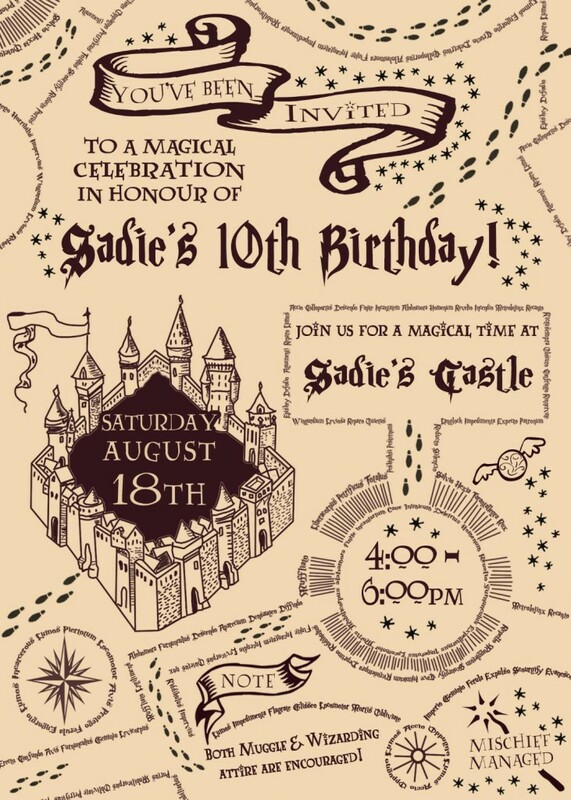 First off, I ordered this invitation for the party and it did not disappoint! 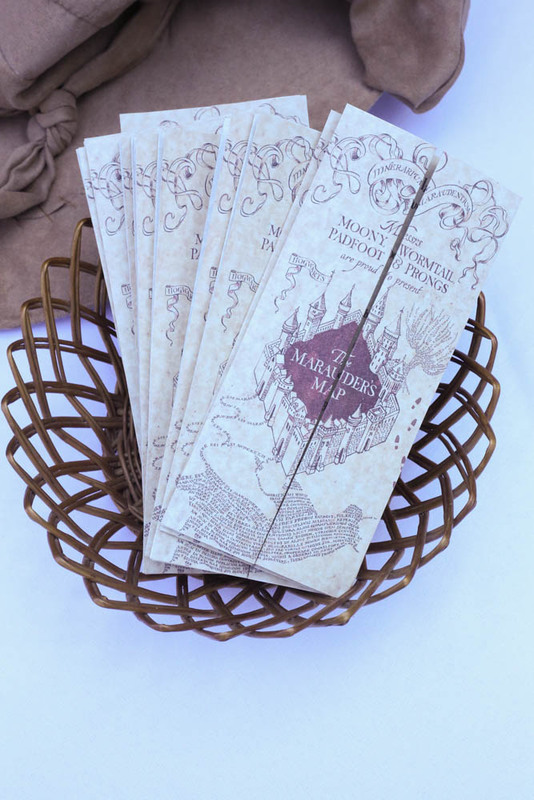 LOVE the marauder’s map theme! 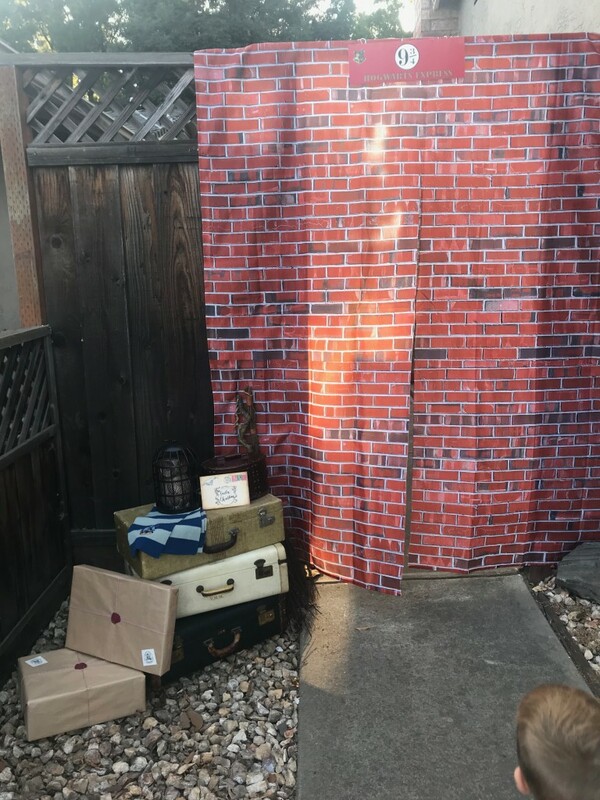 For the entry, of course we had to do the brick entry to platform 9 3/4! I bought this shower curtain (looked amazing! ), and cut it up the center 3/4 of the way, so the kids could walk through! 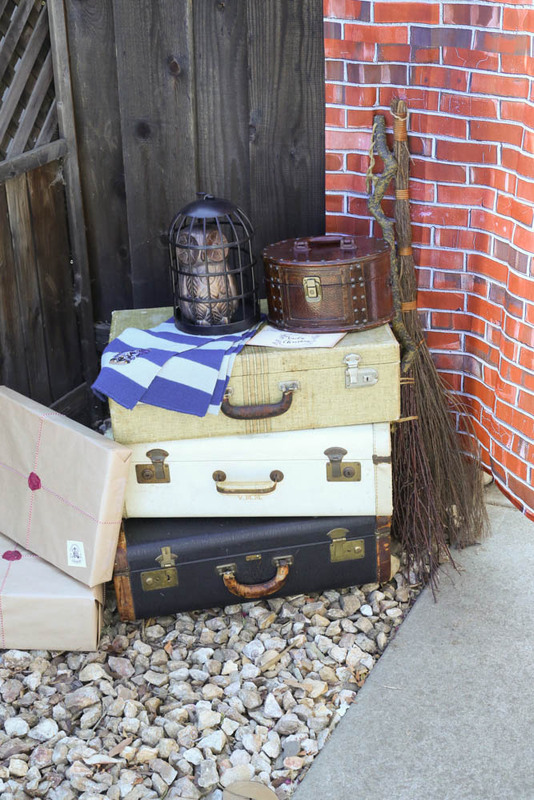 I made the sign as well, and my friend Brett let me use her amazing vintage suitcases! 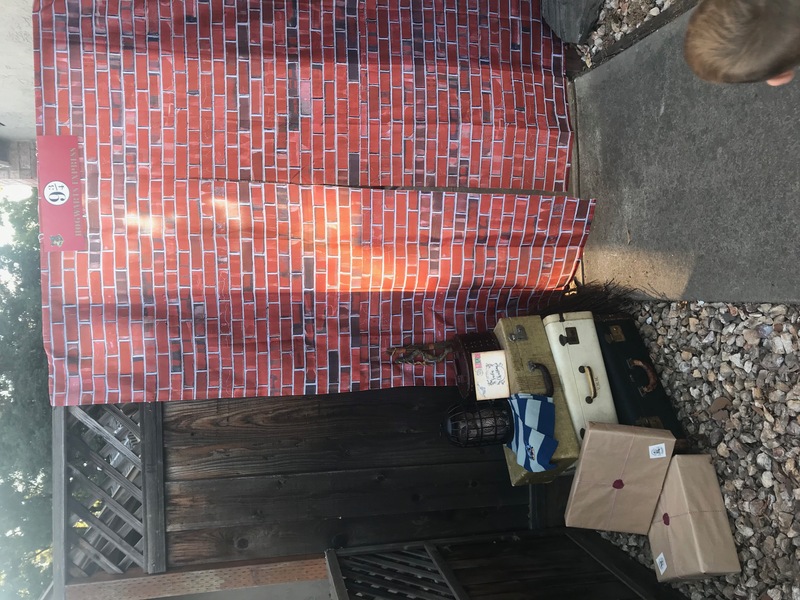 My other friend Kami had thrown a HP party in April so she also let me use a lot of her party decor-I’ll let you know what as we go! 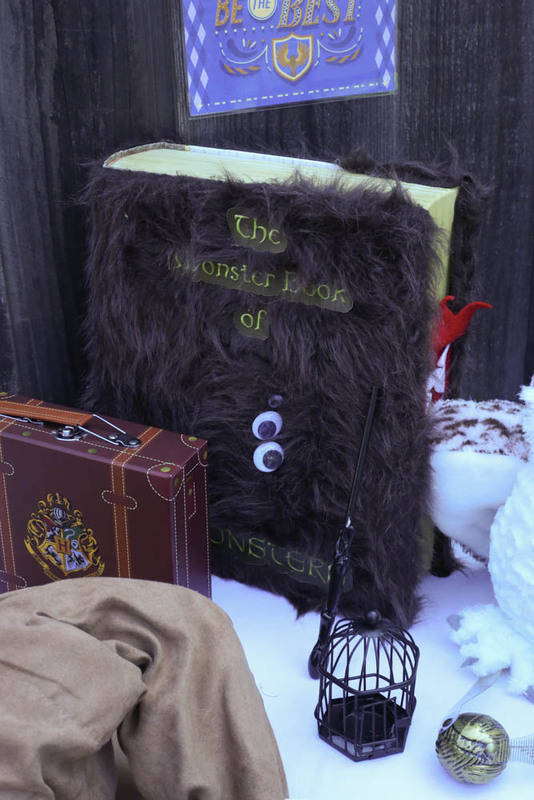 She made the brown packages and let me use her brooms for the entrance. 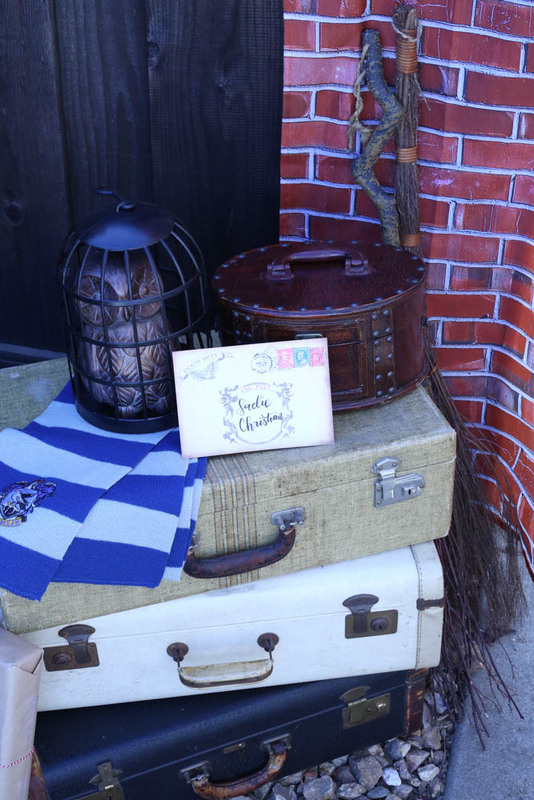 We thrifted the owl and oval case, and the Ravenclaw scarf was a gift to Sadie. She also found that awesome cage at the Dollar store a few weeks before! 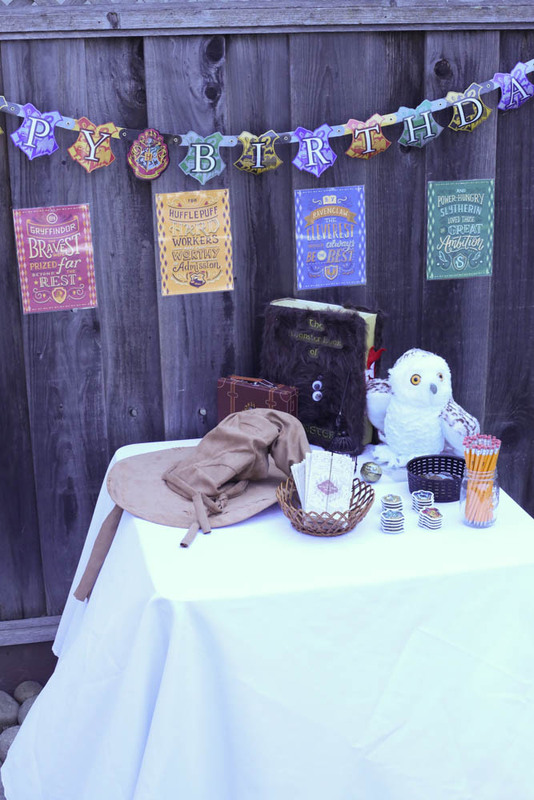 I printed out some house banners and used Kami’s Happy Birthday banner, Monster book, Sorting Hat, and Hedwig! 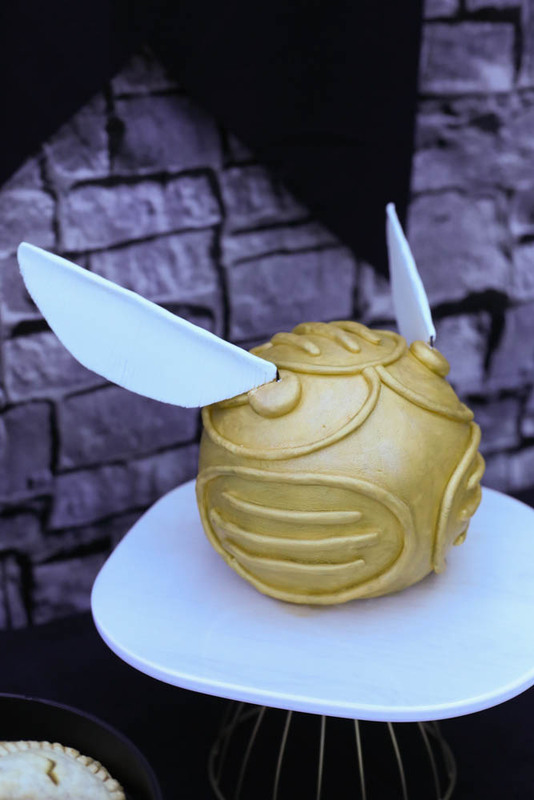 I bought a Snitch and it is soo cute! 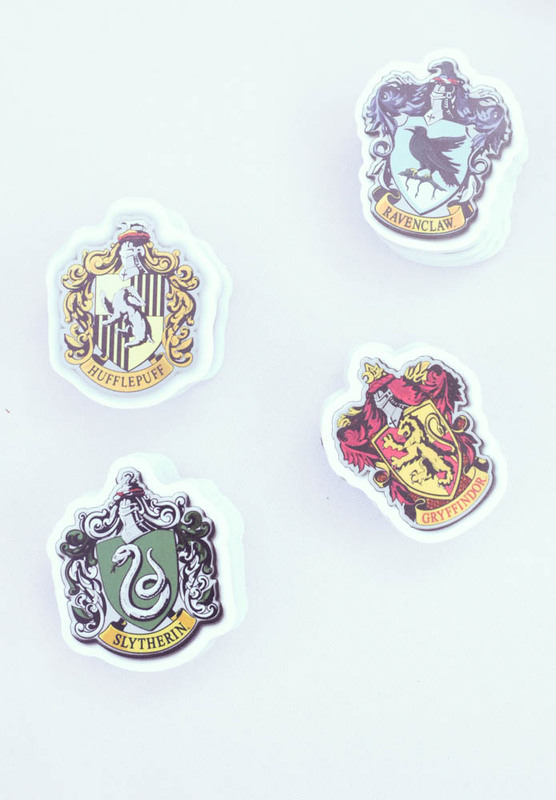 Here are those amazing badges I told you about in this post-the kids loved them and they looked soo great! 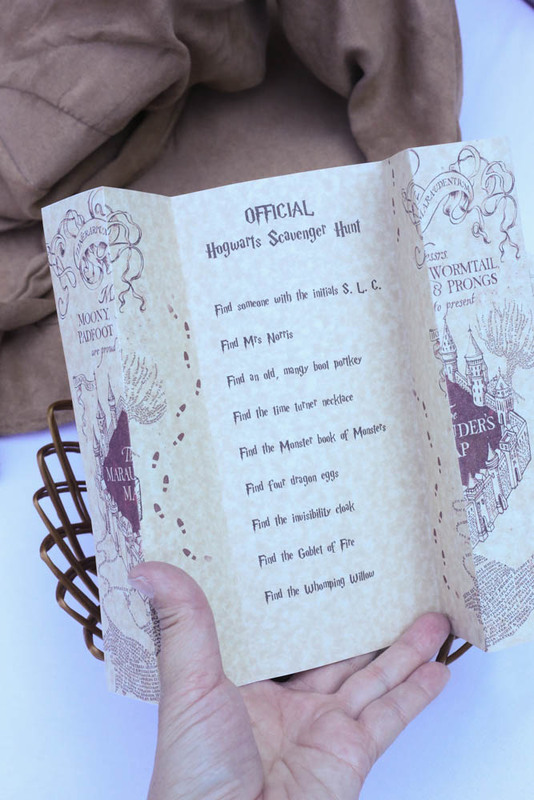 For a fun little game while the kids were arriving, I created these Marauder’s Maps with a scavenger hunt inside with a list of items for them to find! Mostly it was decor, and there were some tricky ones! The invisibility cloak was a hanger I hung on the fence. LOL I crack myself up. aaand probably only myself. 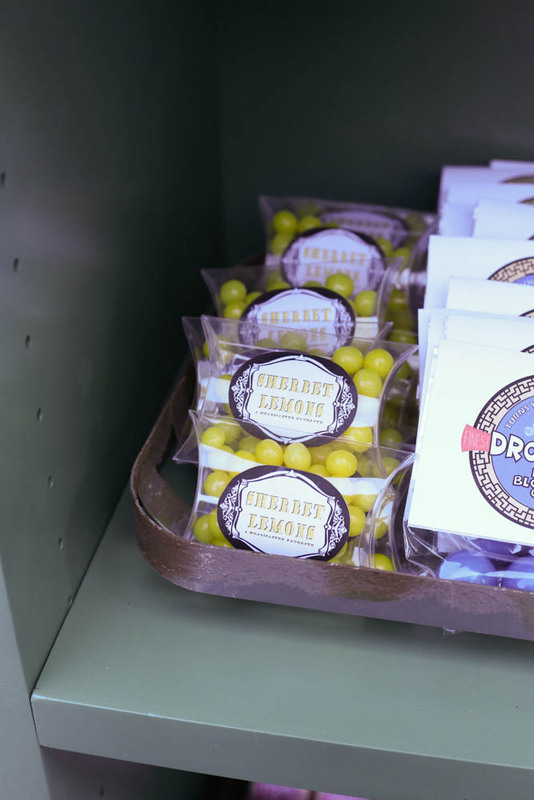 Once they found all of the items, they could return the map to me and collect their galleons, knuts, and sickles for Honeydukes later! 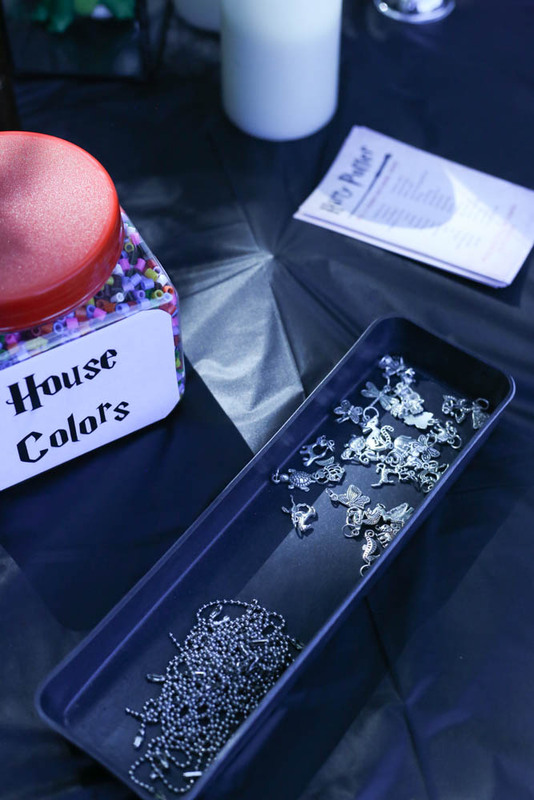 Guess which house Ava the kraken sorted into? lol! she took a quiz beforehand and everything. 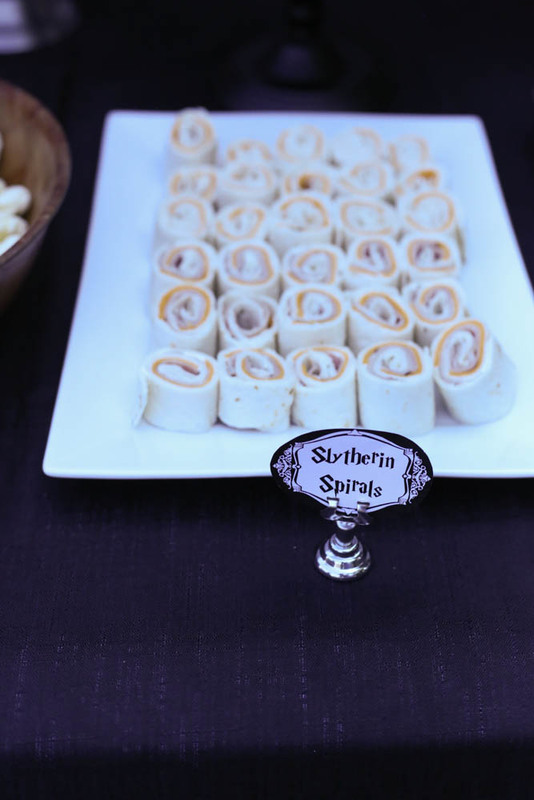 Slytherin through and through. 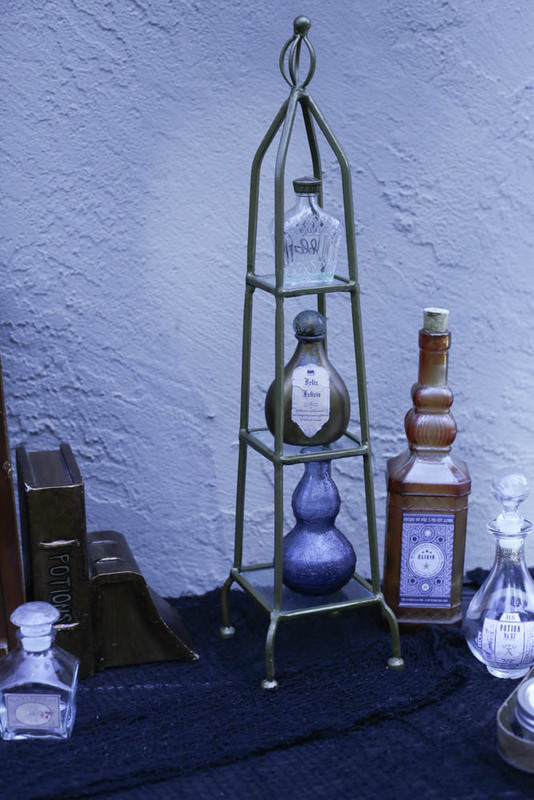 Jack’s Hufflepuff, Sadie’s Ravenclaw, and Charlotte’s Gryffindor. 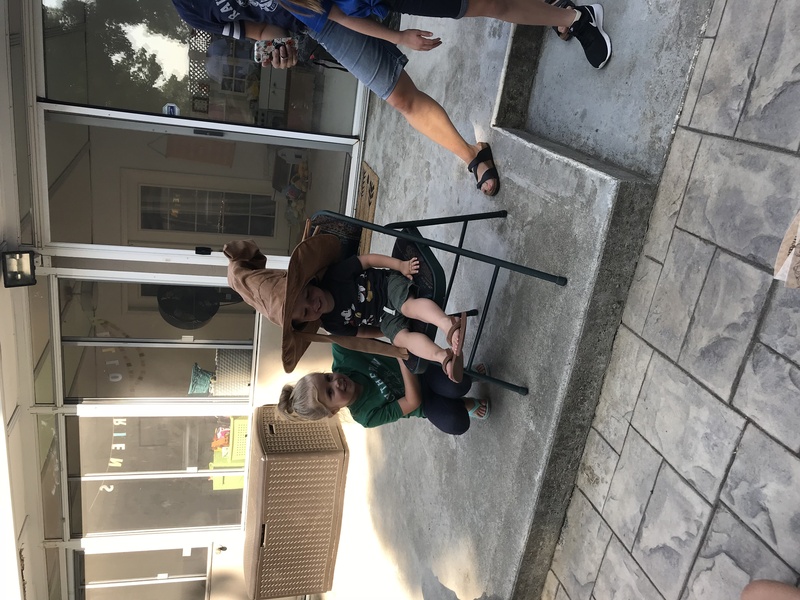 I found some sound bites on You Tube of the sorting hat calling for each house, then pre sorted the kids and just played 10 second clips for each one after placing the hat on their heads. It was super cute and fun! 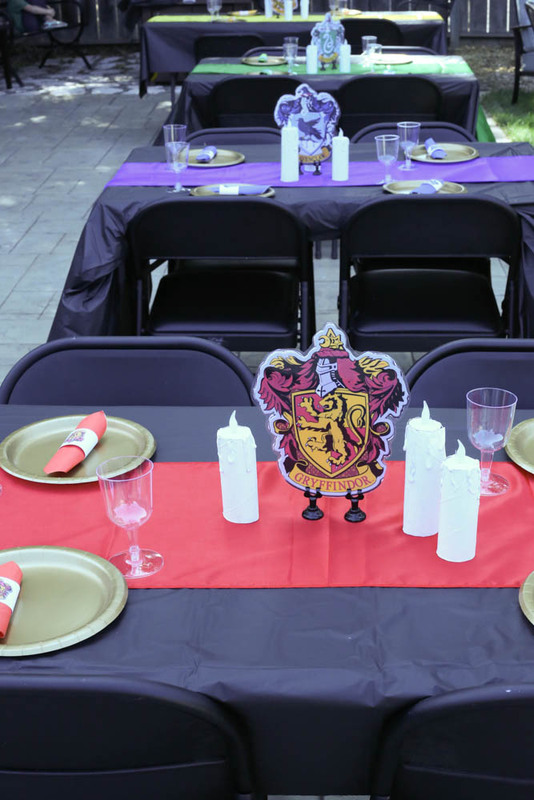 Then they each got their house badge and sat at their house tables! 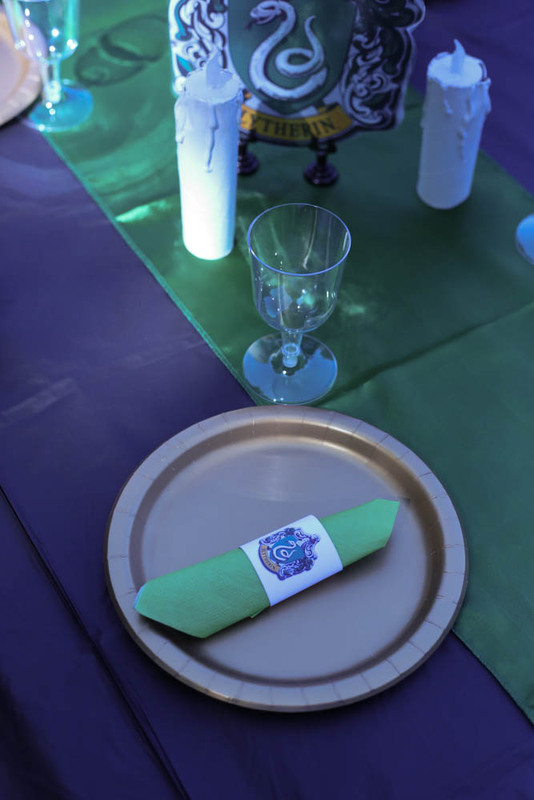 I layered black plastic tablecloths with different colored runners, then some gold plates, and coordinating napkins. Also some fun clear goblets for the drinks later! 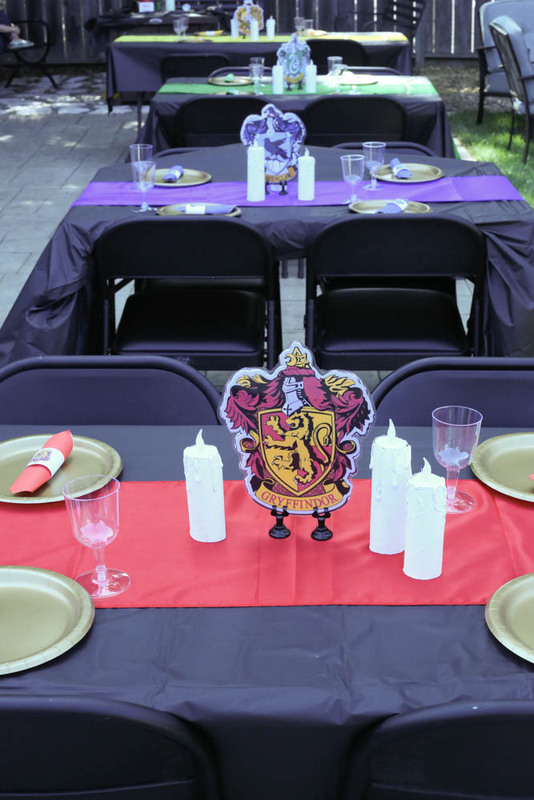 I printed out the crest for each house and laminated them, and added a few paper towel roll candles that Kami had made for her party and I got to use! Then it was time for the FEAST! The table was fairly simple! 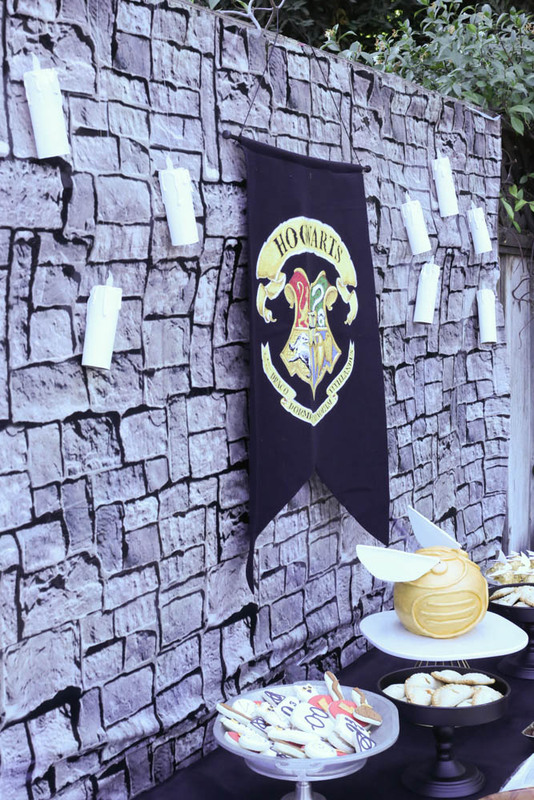 I bought this backdrop which looked surprisingly realistic, then layered it with some more candles hanging by clear thread, and this Hogwarts banner. 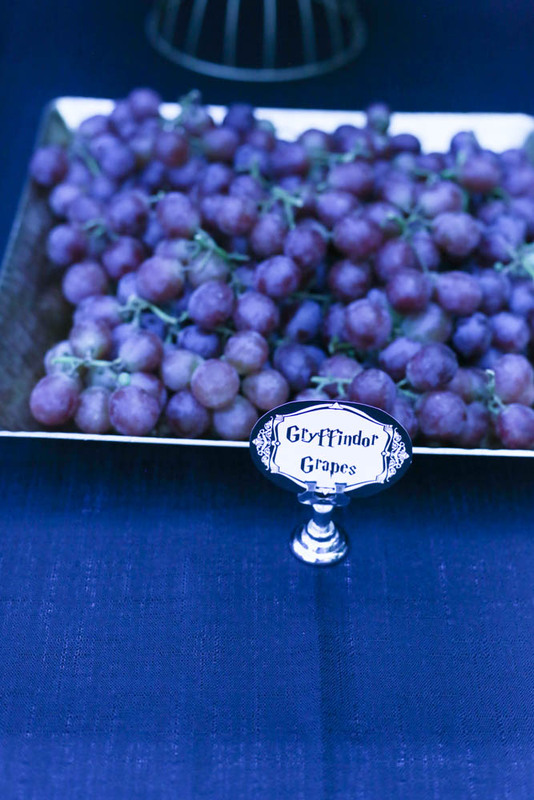 Then the table was set with a white tablecloth and then a black one layered over the top. 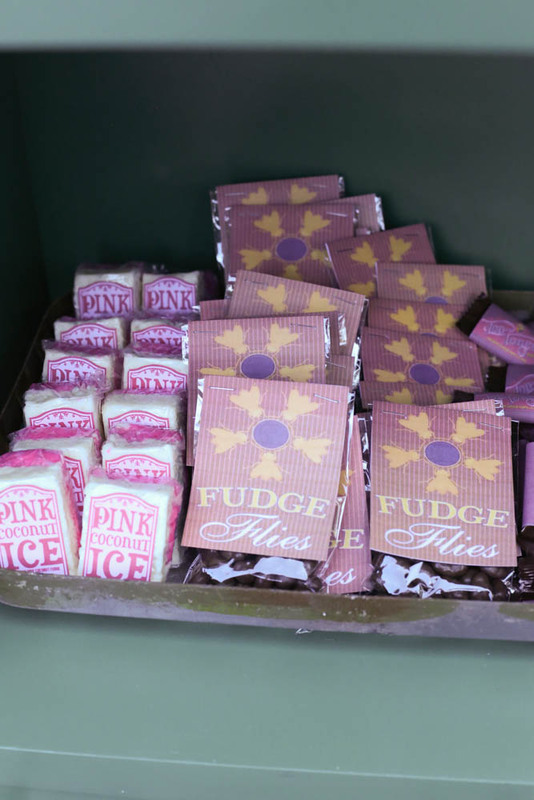 We had cookies of course! I did some owls, glasses, brooms, lightning bolts, deathly hallows symbols, 9 3/4, and wand movements. 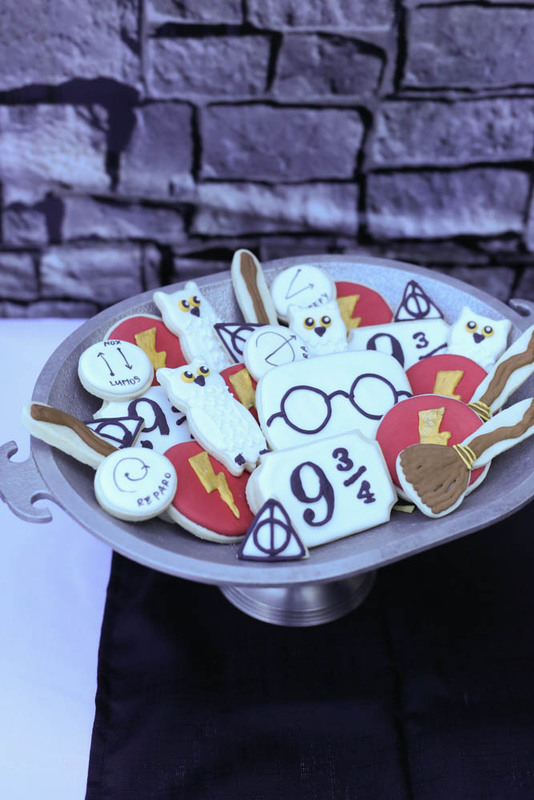 I love the wand ones the best I think! 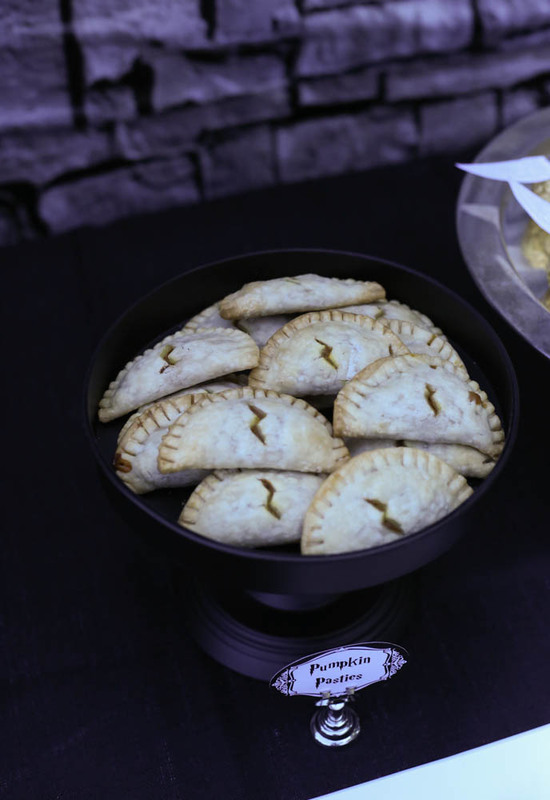 I made some Pumpkin pasties but of course! I love the little lightning bolt! 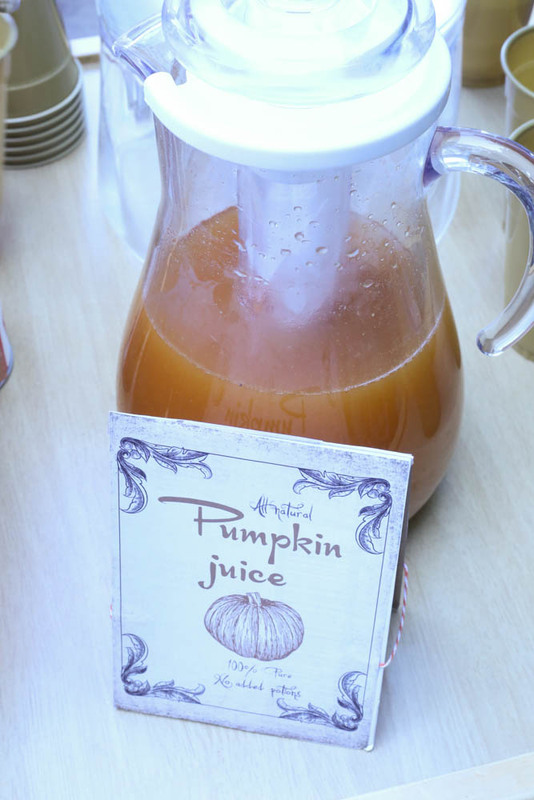 This recipe was amazing, the kids gobbled them up! 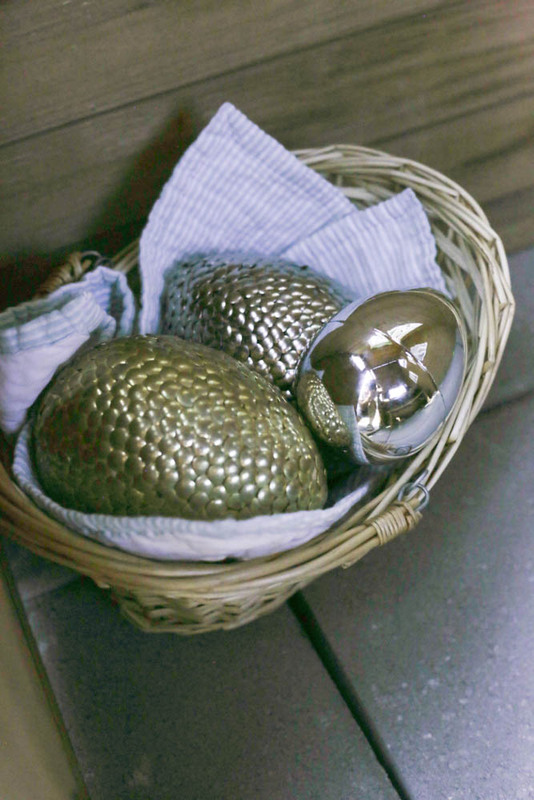 Some golden snitches but of course. The cake! 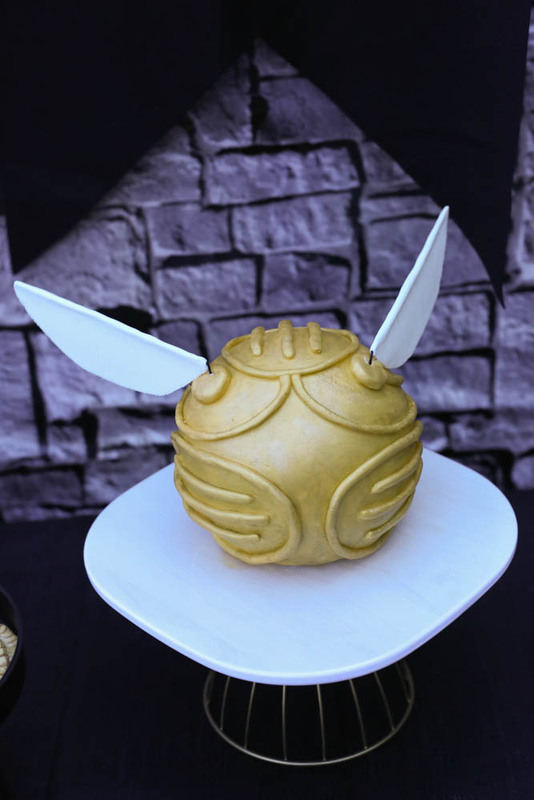 Sadie and I decided on a Golden Snitch cake, and I was soo excited to try a sphere shaped cake! I bought this pan and it worked perfectly! 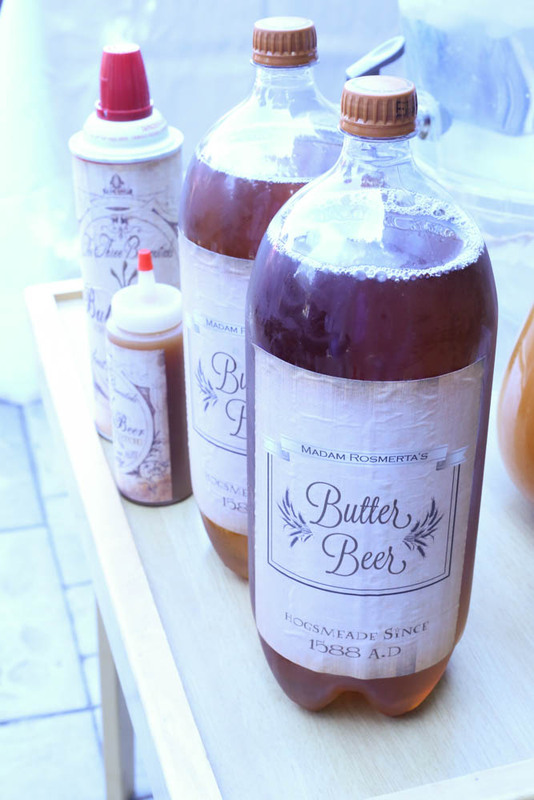 We made a Butterbeer flavored cake but of course, using this recipe for the cake and frosting. It was delicious! 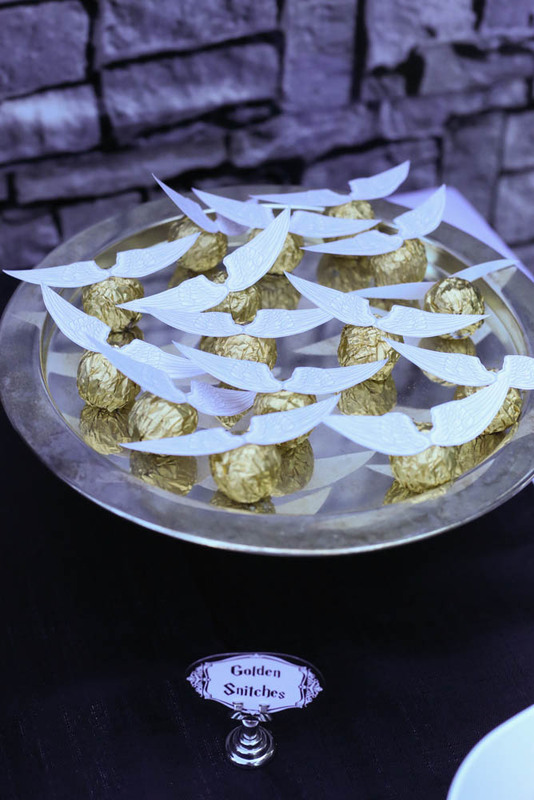 I made the wings out of gumpaste earlier in the week and they looked great! 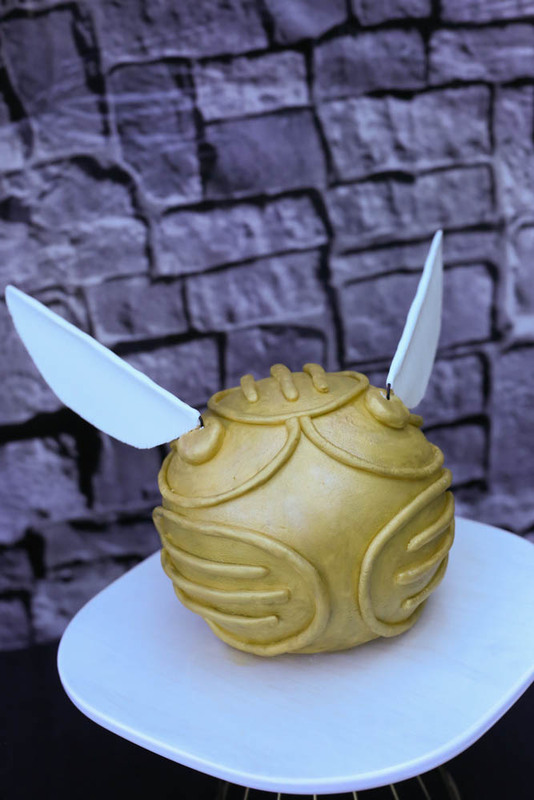 I covered the cake in homemade fondant & details, and then sprayed it with gold edible paint and gold luster dust. On to the classes! 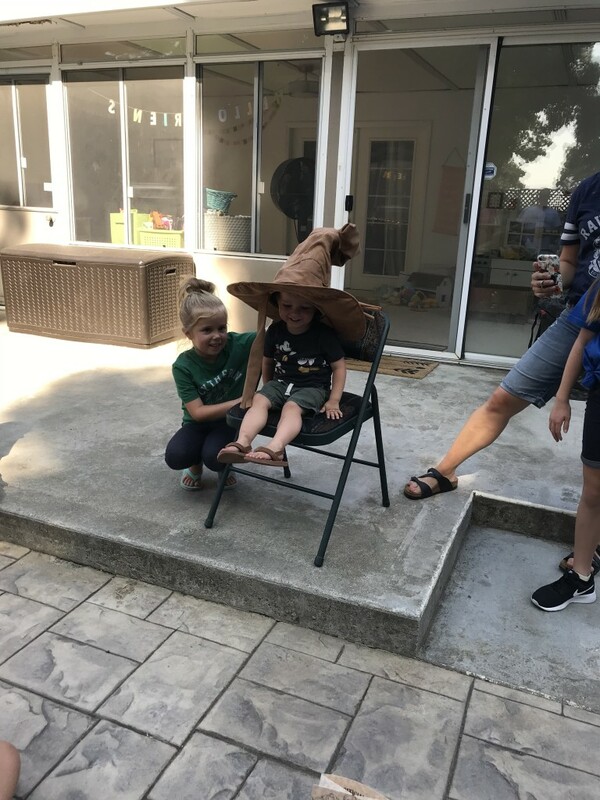 We split up and each house took turns rotating through their classes. 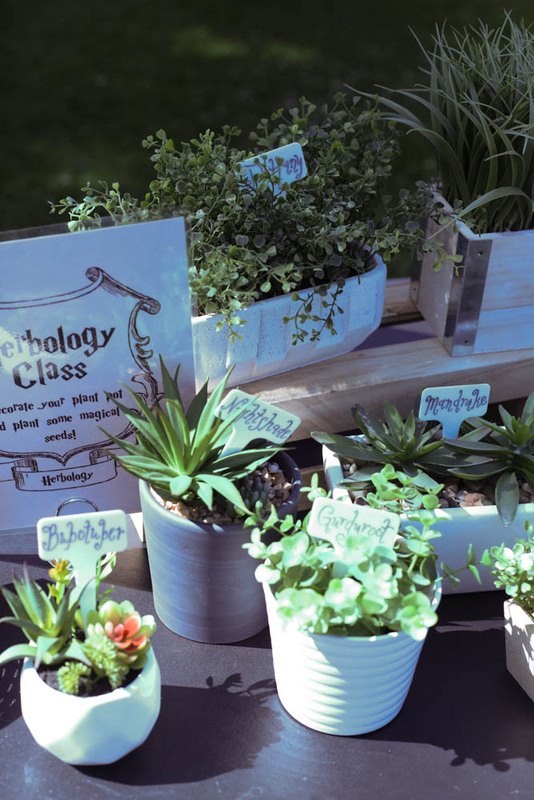 We had Herbology which my mom ran-they got to plant some wizarding seeds and decorate their planters with Harry Potter designs and labels. 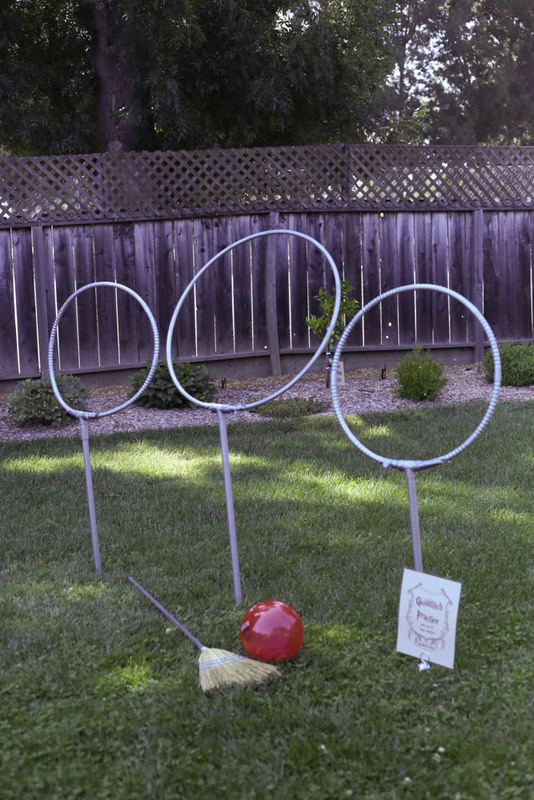 We had some quidditch hoops set up for anyone who wanted to practice, as well. 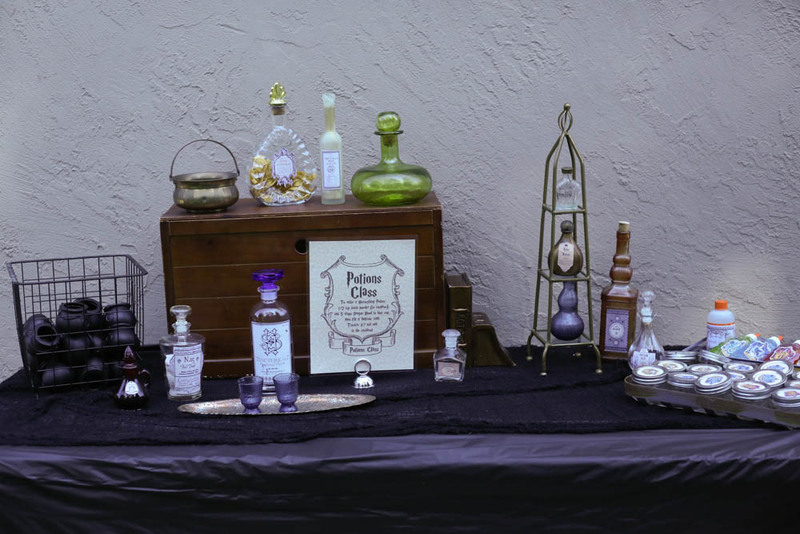 We had a potions class that I ran, can you tell I had fun shopping the thrift stores for cool old bottles!? 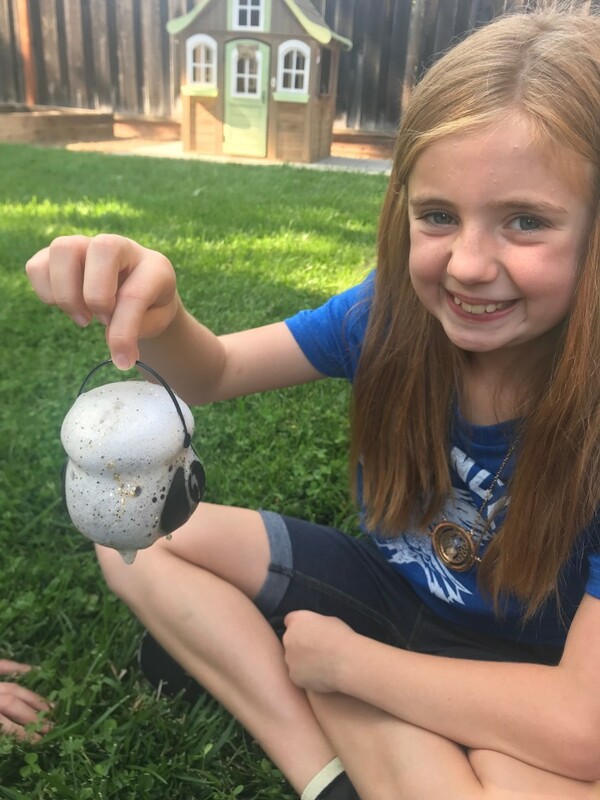 We made slime as one of our potions-with the house colors of course! 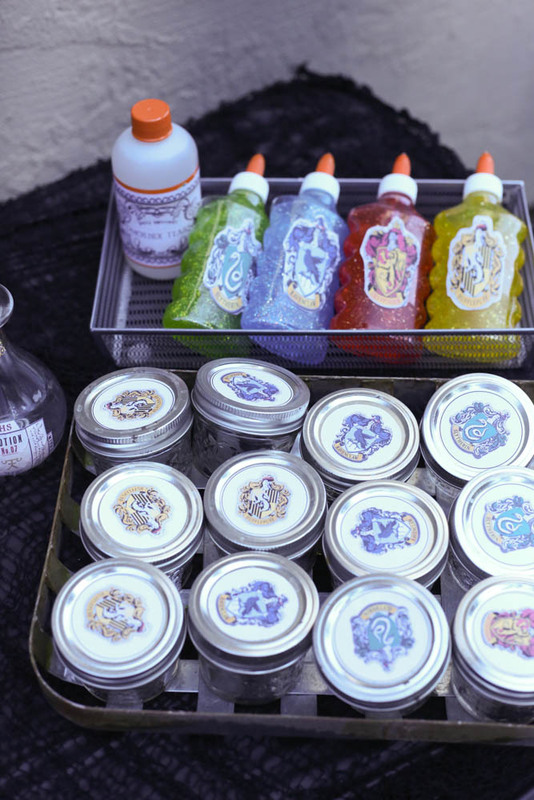 I used this glitter glue and slime activator to keep it super easy and made labels for mini jars to store it in. 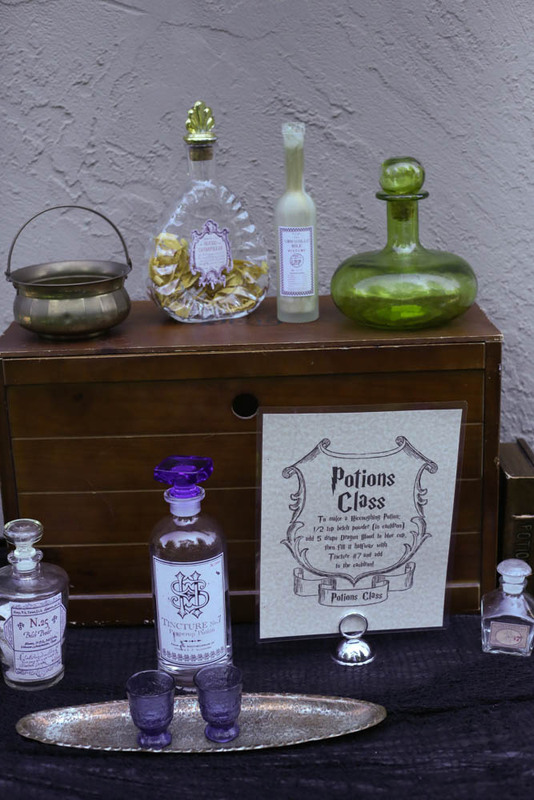 We used mini cauldrons for our other potion. 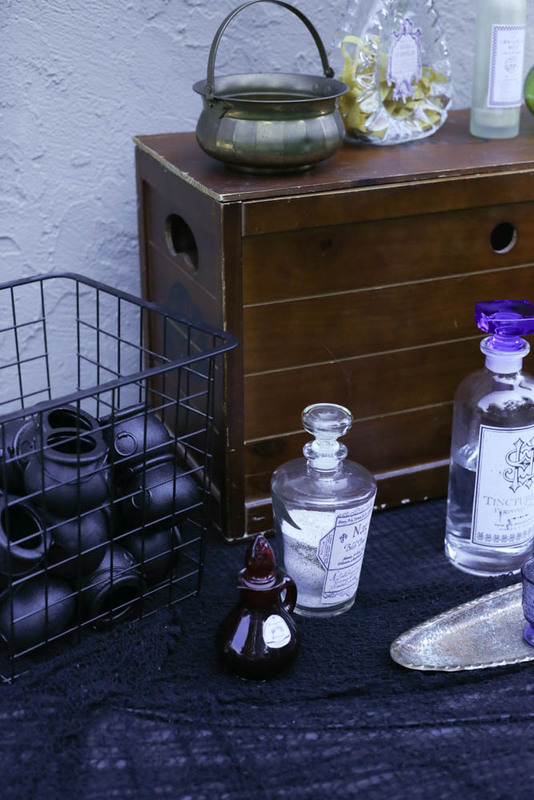 Our recipe was: 1 tsp of glittered baking soda in the cauldron-then mix a few drops of dish soap with vinegar in another cup and add to the cauldron. It foams up like so! 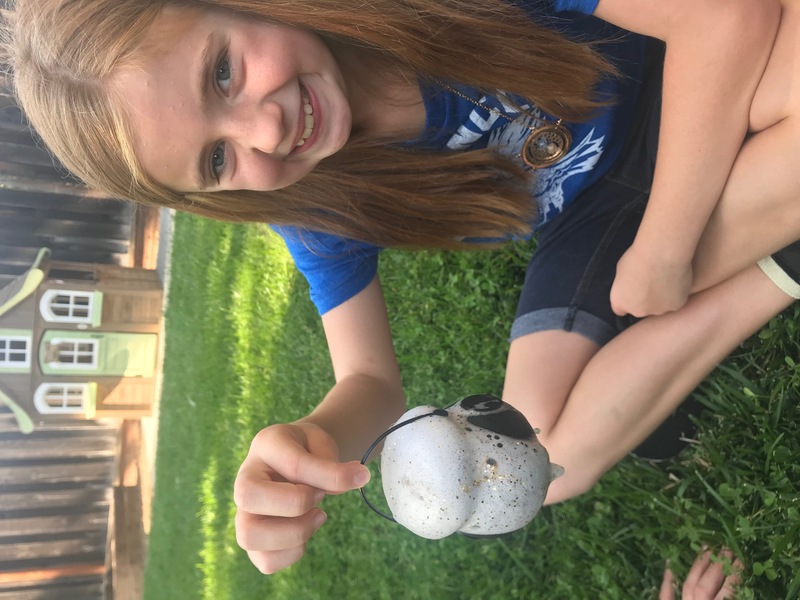 super fun, the kids loved it! 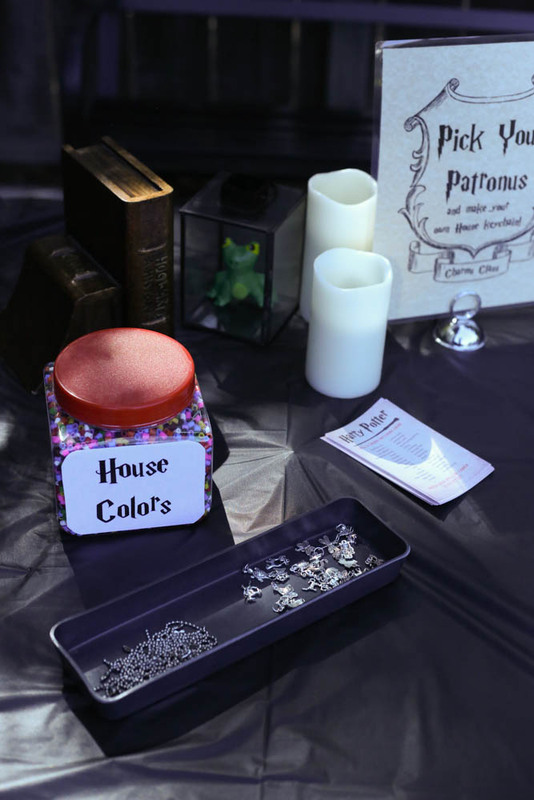 Our other classes were: Charms, where they got to pick their patronus charm and make a keychain…and Transfiguration, which was basically animal charades. We used these ball key chains and some animal charms! 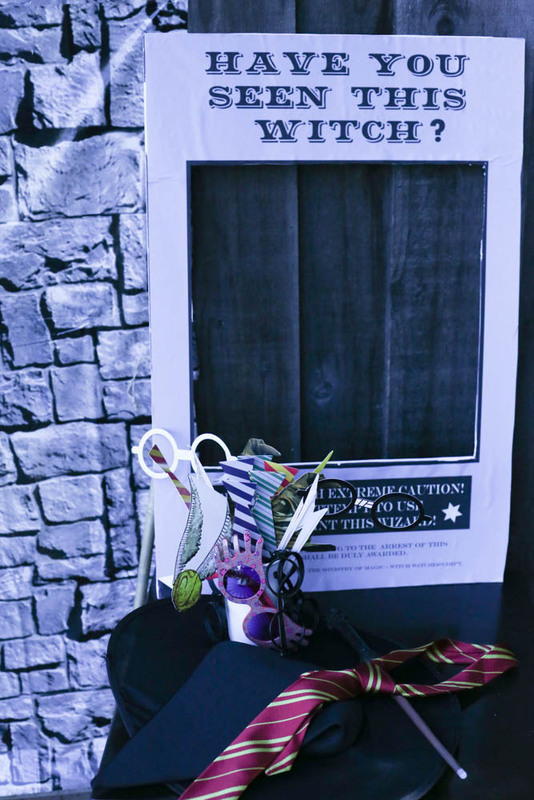 I also set up a photo spot with some of the background and some props, including some paper ties & glasses, Luna’s spectrespecs, Harry’s tie & wand, and a witch hat. 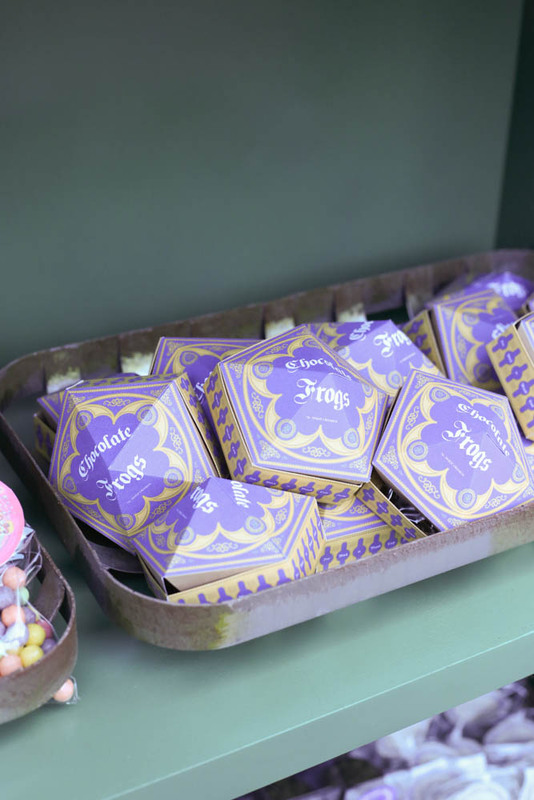 Now on to the showstopper of the party-the Honeydukes Sweet Shop! 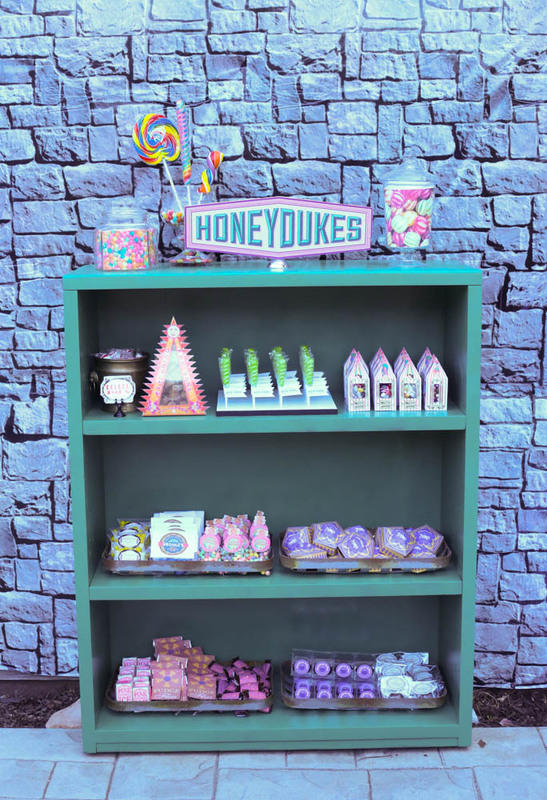 I found a $20 bookshelf online, then a few cans of spray paint transformed it into shelves resembling the ones at the Wizarding world. 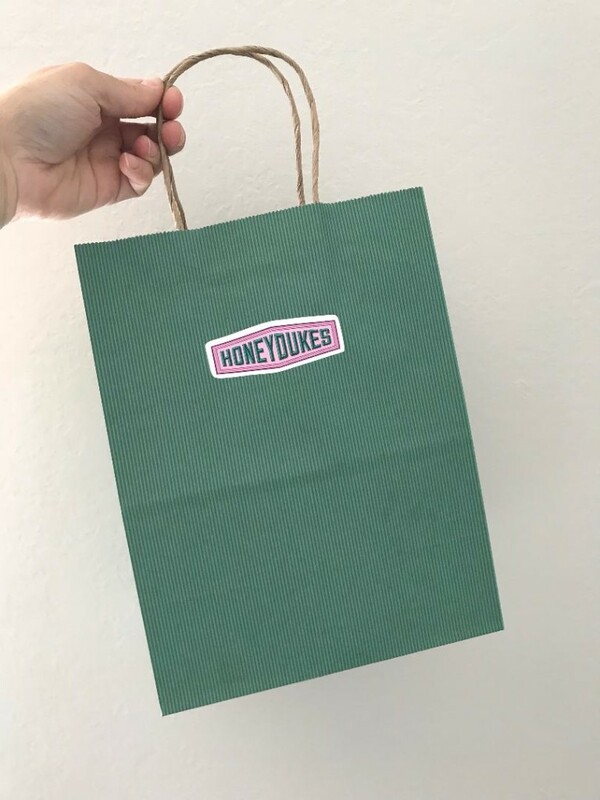 I found these amazing bags and added these Honeydukes stickers I ordered from StickerYou! They look amazing and took the bags up another notch. 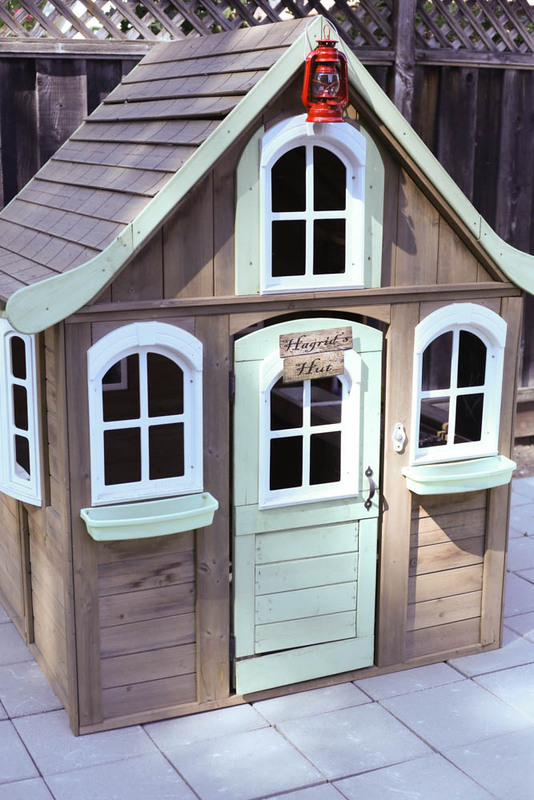 I let the kids come up, one house at a time, and go “shopping”! 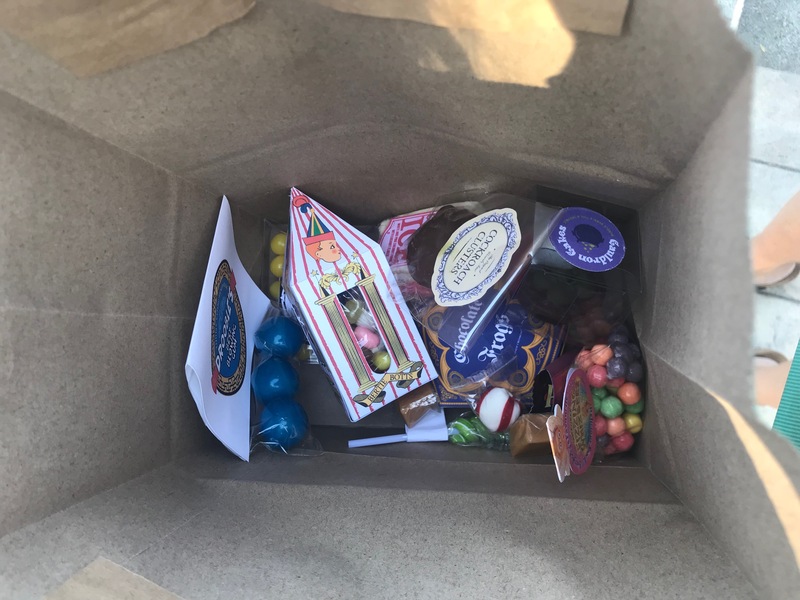 They gave me their galleons, knuts, and sickles from before (if they hadn’t lost them lol), and they got one of each item, if they wanted. 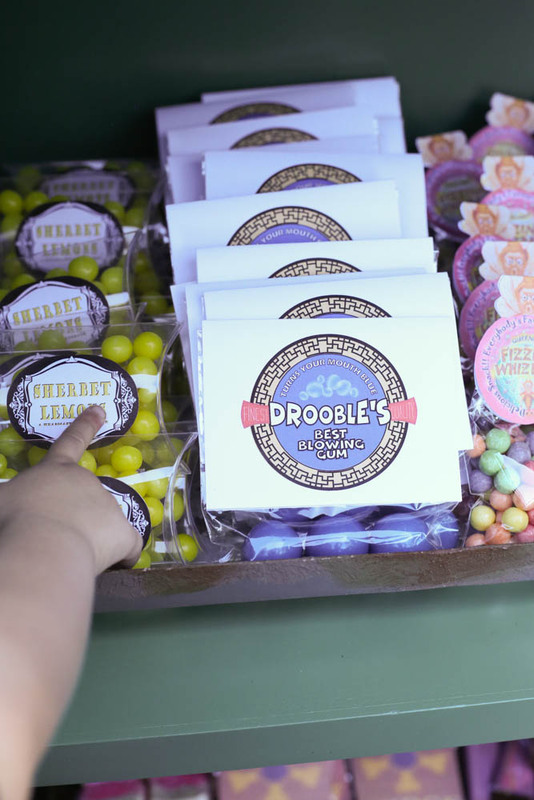 Most kids took one of everything except if they didn’t like a certain candy of course. 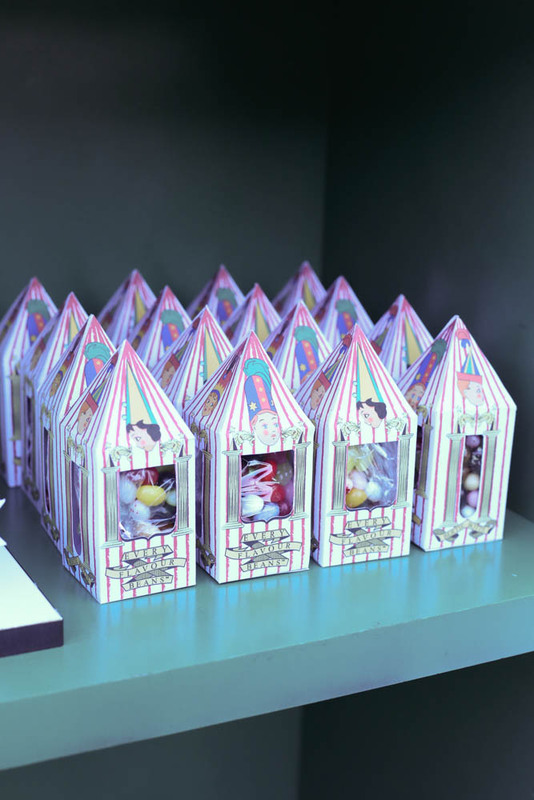 I poured some extra jelly beans into a glass jar I had, and stuck some fancy lollipops into it for a little display! 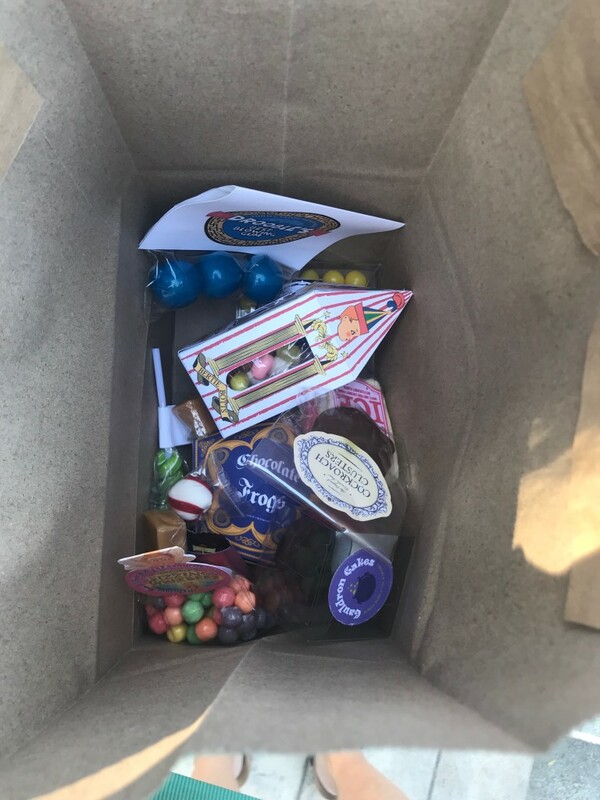 I printed out pictures of candy and added them to a couple other jars. 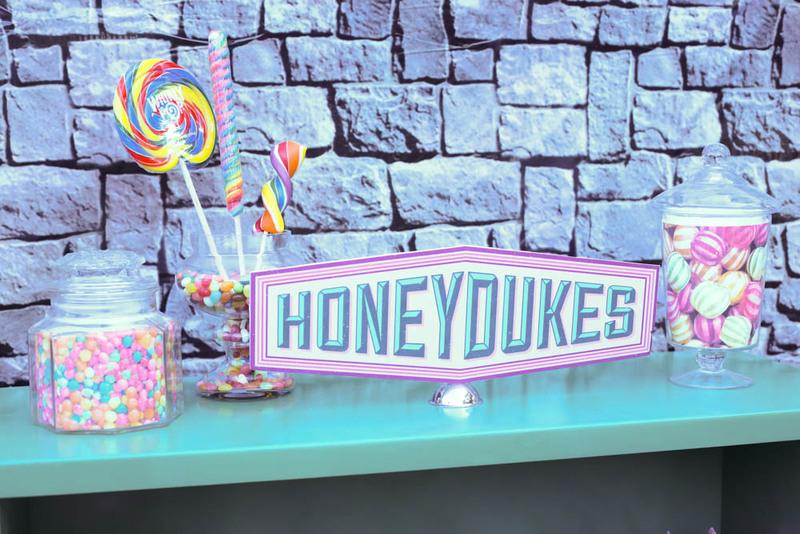 The sign graphic I purchased from this shop, and printed it out on cardstock from Staples, then mod podged it into some foam board. (I used the same image for the stickers too!) 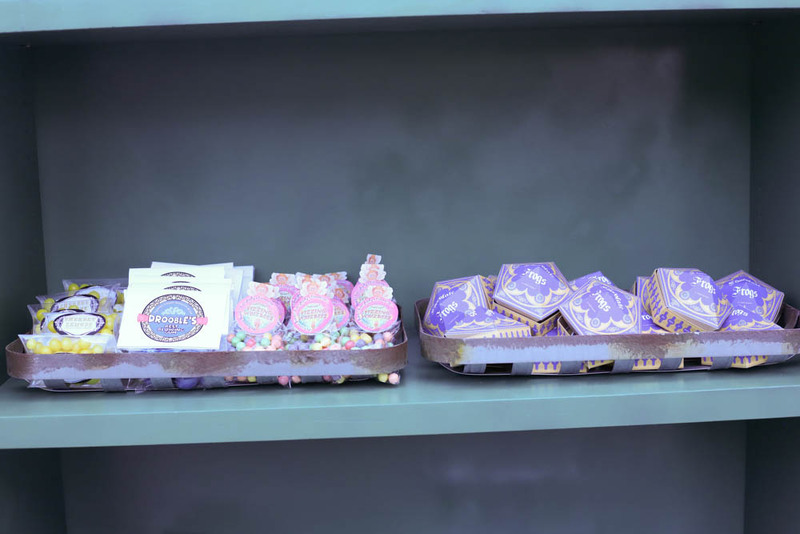 I also ordered the chocolate frog printable and other signs from that shop, but it looks like they are taking a break right now. 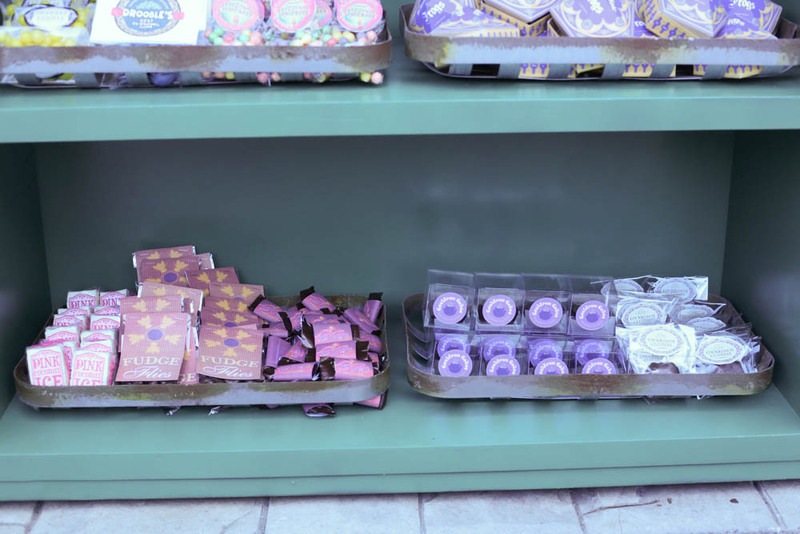 middle shelf: sherbet lemons, drooble’s best bubble gum, fizzing whisbees, and of course, chocolate frogs! 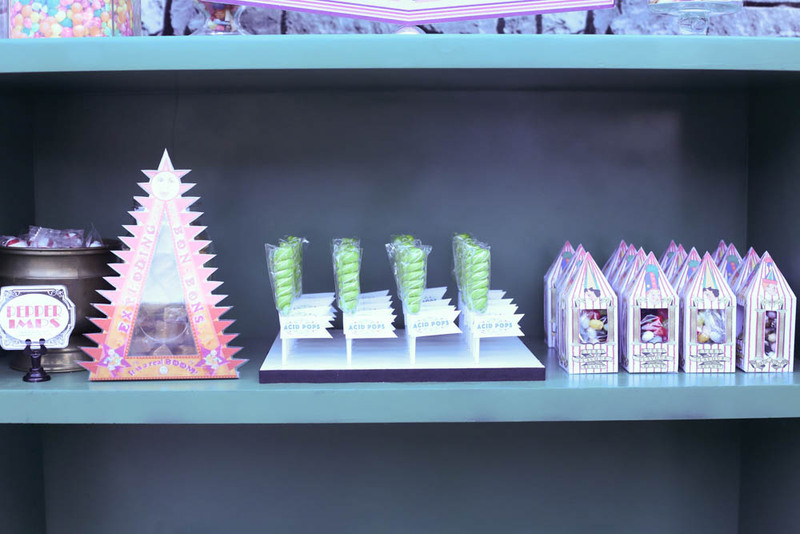 bottom shelf: coconut ice, fudge flies, ton tongue toffee, cauldron cakes, and cockroach clusters. 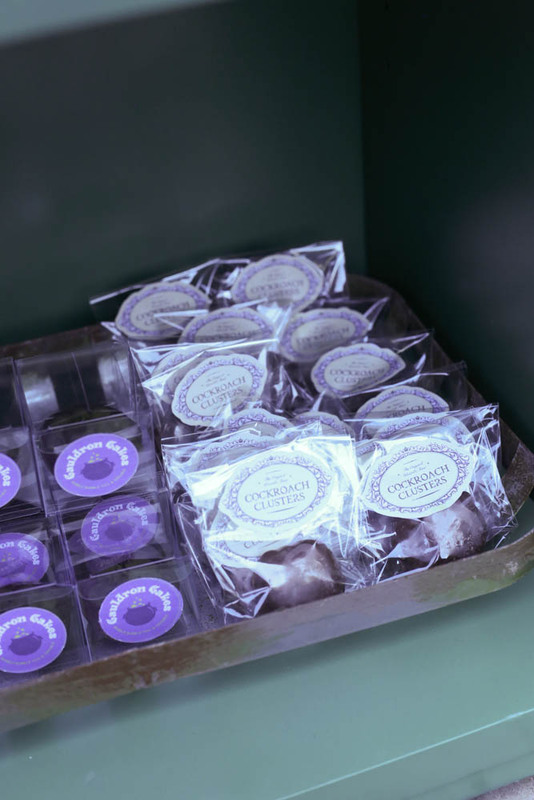 I used the cockroach cluster and cauldron cake printable from that seller I mentioned, and then packaged up some turtles in tiny cello bags. Printed most of my labels on this sticker paper! The cauldron cakes were brownie bites that I piped some green frosting “bubbles” on top and popped into some clear boxes. 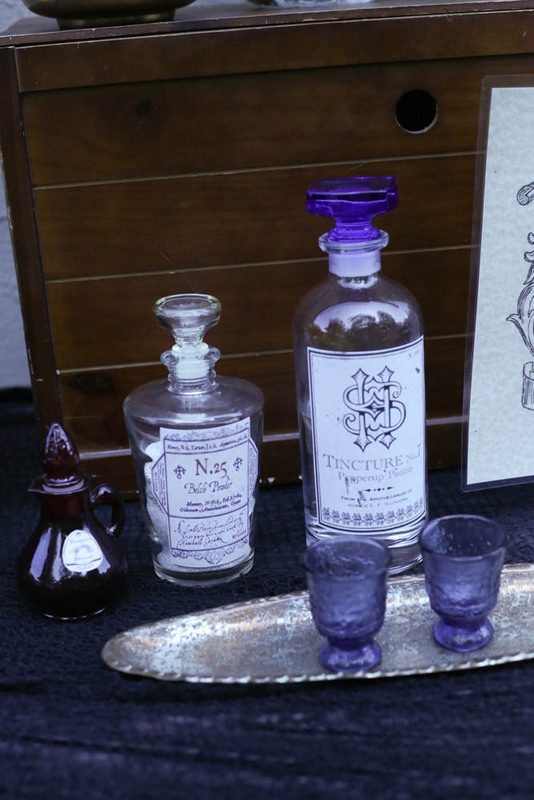 I had a ton of packaging items leftover from other parties, so it was great to use them up! 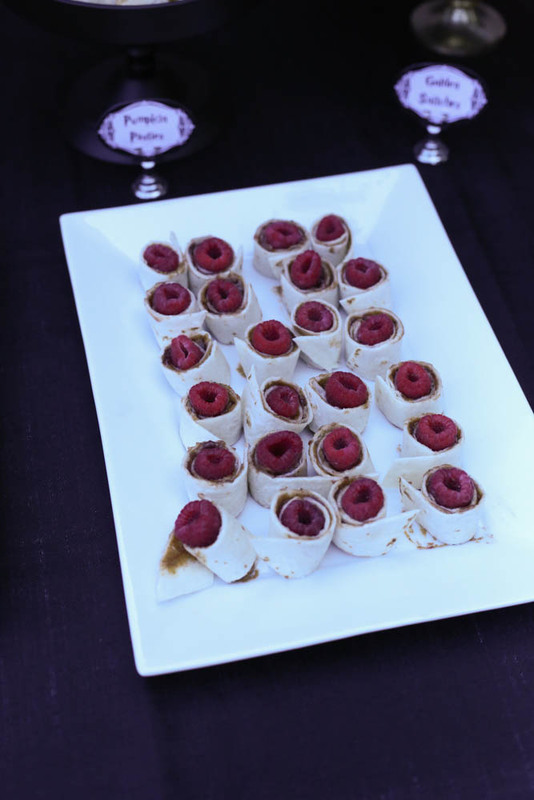 I created a ton tongue toffee wrap using an image I found online, and then wrapped them around mini heath bars! The fudge flies (chocolate covered raisins) were packaged up in cello bags with labels I doctored up. The coconut ices I made with this recipe, made in an 8×8 pan and then cut up into smaller pieces wrapped in saran wrap and added a label. 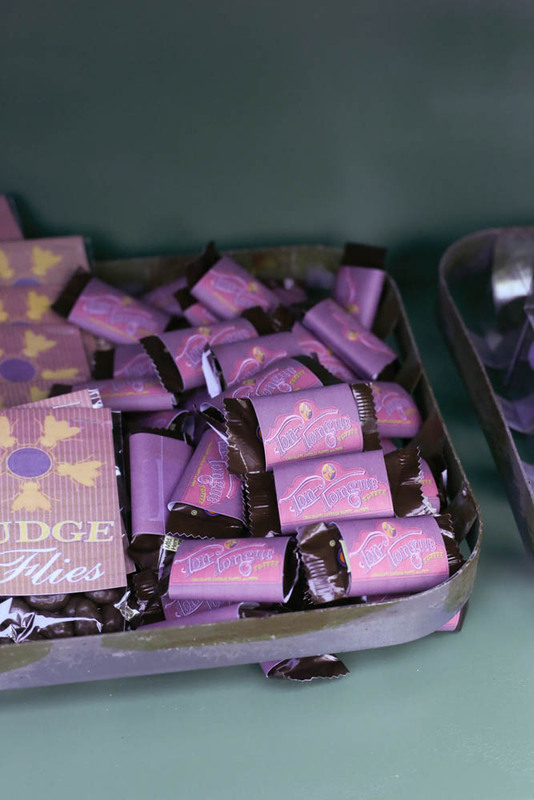 The chocolate frogs. dang these were a lot of work! 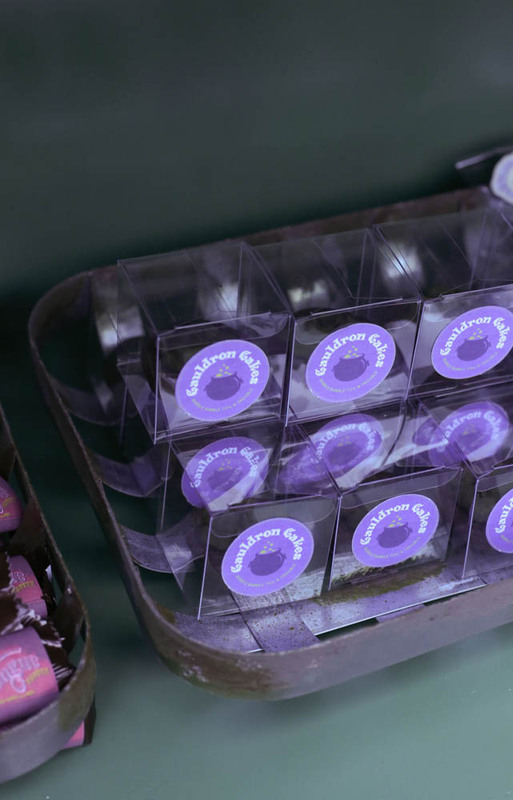 Each box had to be scored, folded, and glued, and took me hours…of tv. 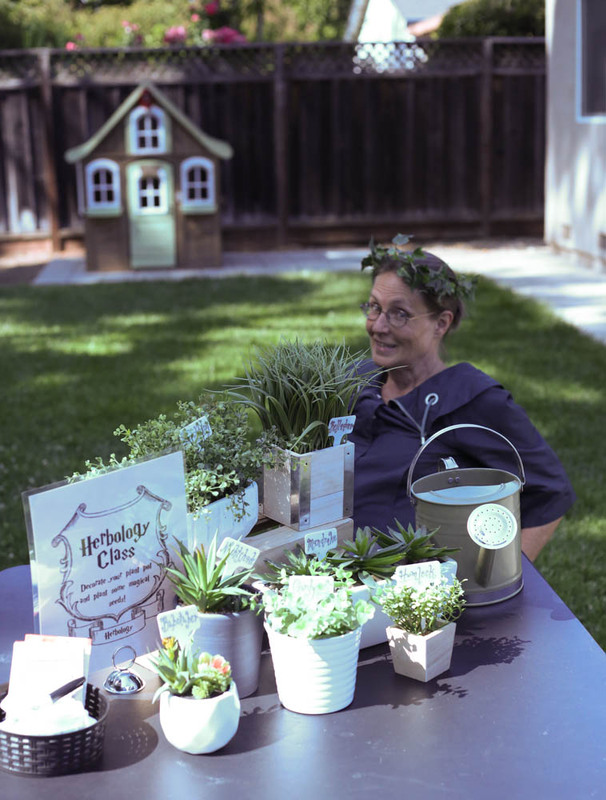 It really wasn’t that bad since I kind of like those kinds of busy work craft projects. 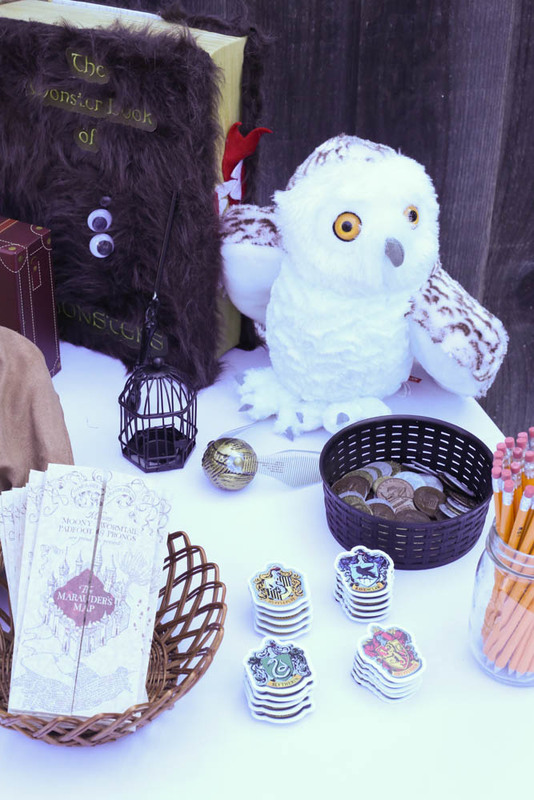 I also made the wizarding cards that came along with the printable, and laminated them so hopefully they are still floating around houses somewhere…lol. 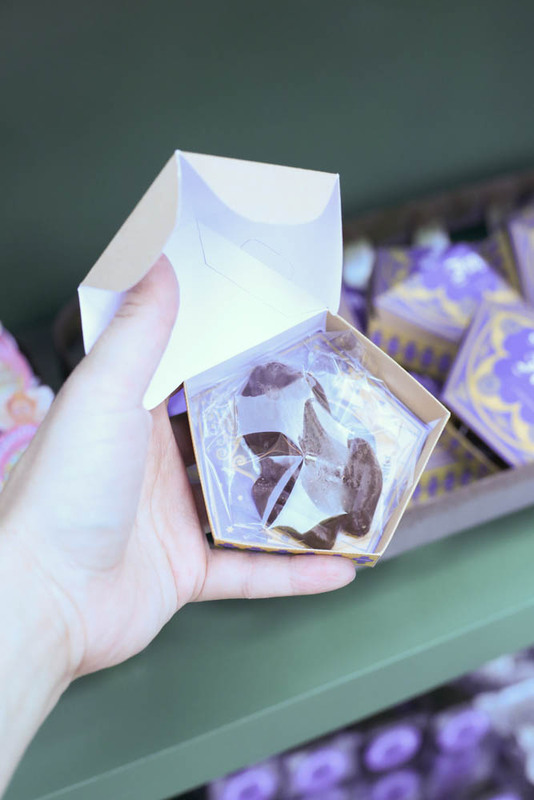 I used this mold for the chocolate frogs, and since it was a warm day, made sure to package them up in bags so they wouldn’t melt all over the place. 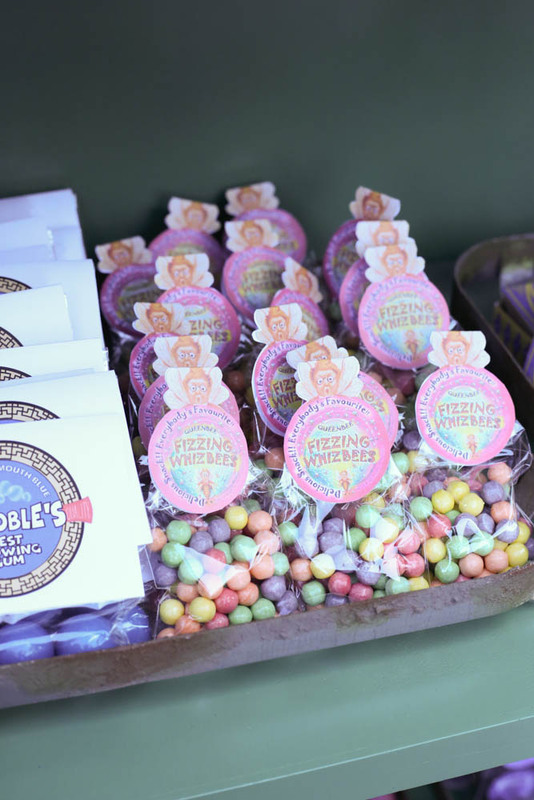 The fizzing whisbees were chewy sweet tarts in bags, with a foldover label that I found online, made the right size, and printed onto cardstock. OH GOSH I forgot about these. these took forever too but were equally charming when they were finished so I didn’t care! 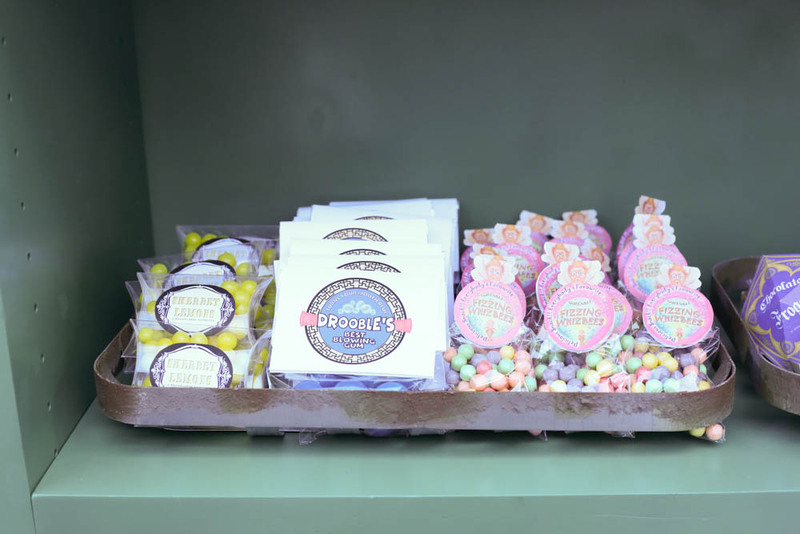 I used this free printable but I think I scaled it down a bit so I wouldn’t have to buy too many jelly bellys! This was another labor of love that no one else really cared about so please validate all the time I spent on them. 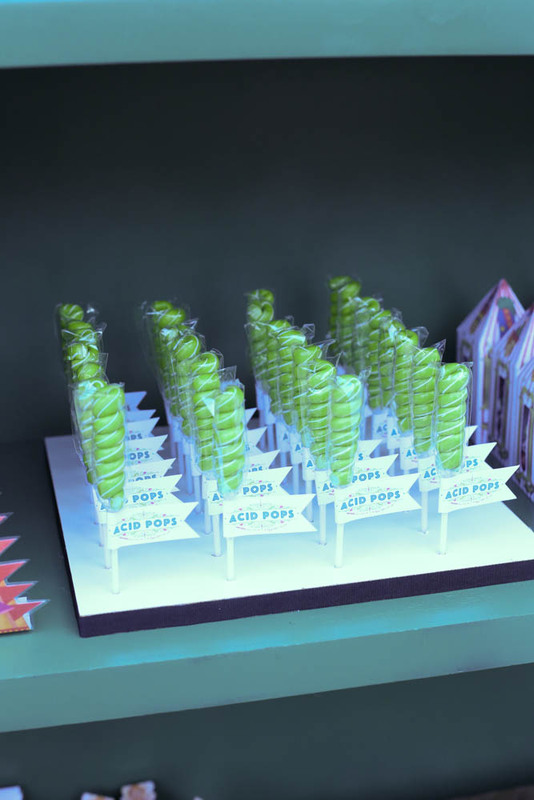 I bought these green apple pops (the perfect acid green!) 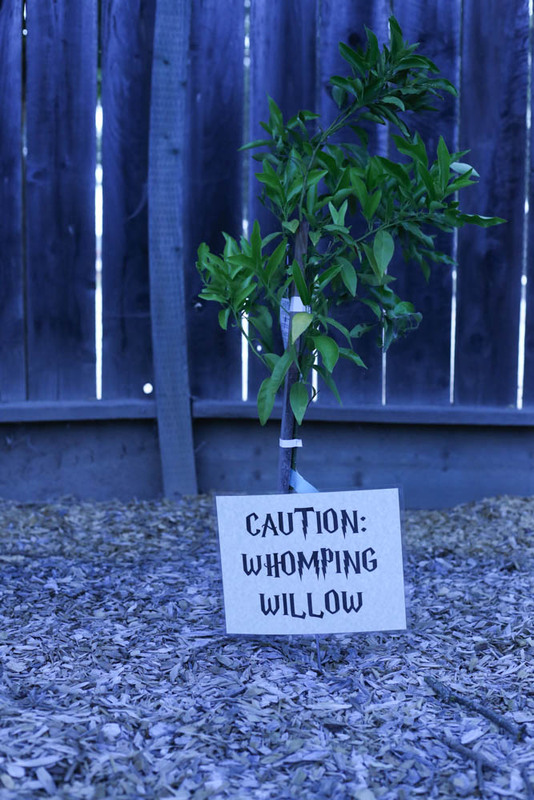 and added a label, then made a quick holder by drilling some holes into a piece of wood we had in the garage, and glued a ribbon around the edge to finish it off. 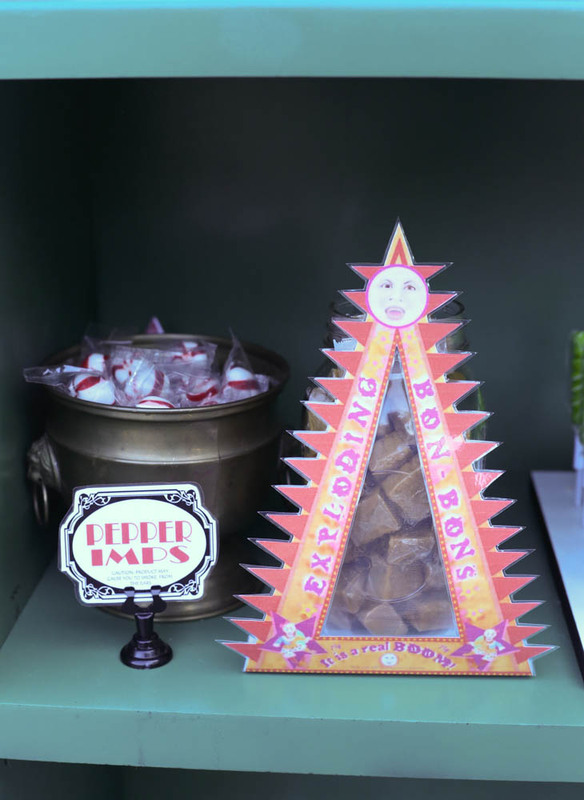 The pepper imps (soft peppermints) I added to an old looking cool cauldron, and the exploding bon bons (caramels) I added to a jar and made the printable to kind of wrap around it! alright! you did it you made it to the end. No words! This was the most amazing party I have ever seen! That cake! Oh my gosh! I am so impressed. You outdid yourself this time! What an awesome party! 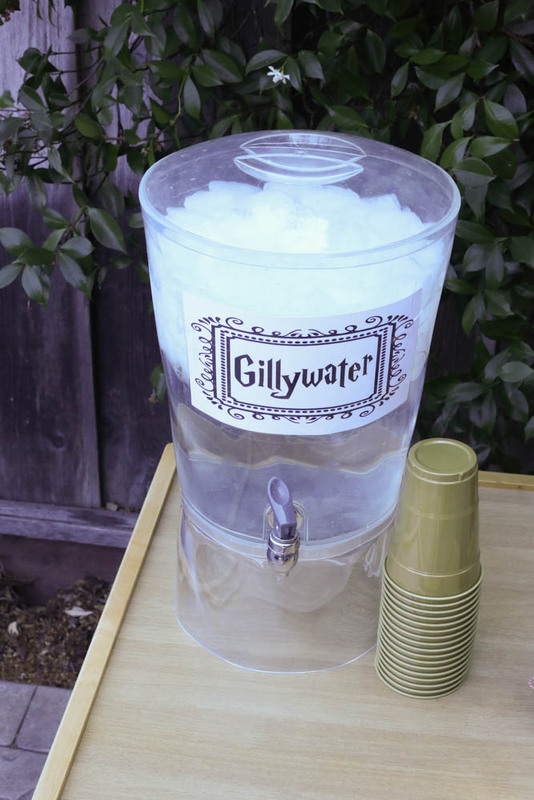 Your daughter is very lucky to have a mom willing to make a party so realistic. 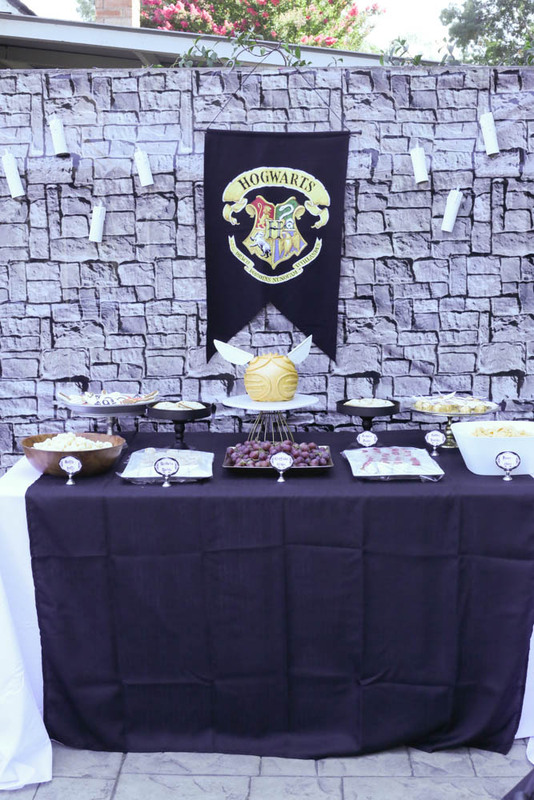 I wish I were invited, I LOVE Harry Potter too! you did a wonderful job and I’m sure this will be remembered for a lifetime. thank yoU! it really was in part a party for my teenaged self lol! Wow! I think you should win mother of the year award ?! What a great party you threw!